Dolby 3D (formerly known as Dolby 3D Digital Cinema) is a marketing name for a system from Dolby Laboratories, Inc. to show three-dimensional motion pictures in a digital cinema. Dolby 3D uses a Dolby Digital Cinema projector that can show both 2D and 3D films. For 3D presentations, an alternate color wheel is placed in the projector. This color wheel contains one more set of red, green, and blue filters in addition to the red, green, and blue filters found on a typical color wheel. 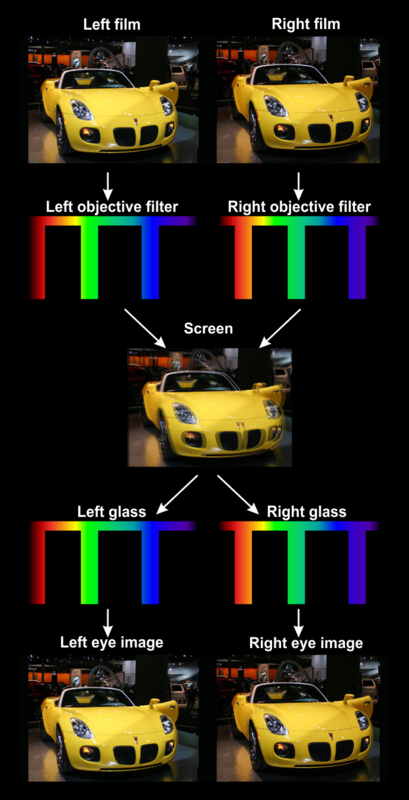 The additional set of three filters are able to produce the same color gamut as the original three filters, but transmit light at different wavelengths. Glasses with complementary dichroic filters in the lenses are worn, which filter out either one or the other set of three light wavelengths. In this way, one projector can display the left and right stereoscopic images simultaneously. This method of stereoscopic projection is called wavelength multiplex visualization. The dichroic filters in the Dolby 3D glasses are more expensive and fragile than the glasses technology used in circular polarization systems like RealD Cinema and are not considered disposable. However, an important benefit of Dolby 3D in comparison with RealD is that Dolby 3D works with conventional projection screens.